The shape of a diamond engagement ring is intentionally created with no defined beginning or end, to symbolize love eternal. We craft all of our engagement rings with eternity in mind. A diamond engagement ring is meant to last many lifetimes, and a ring from Danforth Diamond is no exception. To ensure you get affordable engagement rings that will wow, we use the highest quality precious metals for our settings and only the most beautiful EGL, AGS, IGI and GIA graded diamonds. This means when you choose your diamond engagement ring from our online store, it will stand the test of time and become a family heirloom. When you begin shopping for rings, you have to learn how to choose a diamond and how to narrow down all your choices so you purchase the right diamond engagement ring for your special someone. 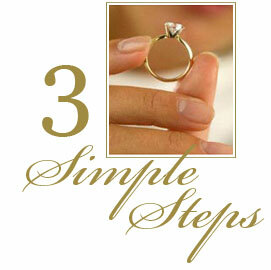 Below are some steps that will help you choose your diamond engagement ring wisely. The current standard for an engagement ring budget is to spend the equivalent of two month's salary on a diamond engagement ring. This standard gives you a good starting point, but you may decide to take a different approach. What is important is that you choose the diamond engagement ring setting and stone that your girlfriend or fiancé will be delighted with and that you can afford. The experts at Danforth Diamond understand the pressure placed on engagement rings, and so we have developed a simple and informative guide to help you find the rings that best suit your lifestyle as a couple. Our experts at Danforth Diamond have selected high quality, EGL AGS, IGI and GIA graded diamonds for our inventory. It is our goal to educate our customer on the 4 C's of diamond buying that diamond experts use when valuing a diamond stone. We want to make the process of purchasing a ring as comfortable as possible. That is why our online store offers a wide selection of shapes and sizes with detailed explanations of quality and costs. We want you to purchase the stone that's perfect for you both in quality and price. Choosing an engagement ring that she'll love may be easier than you think. Our experts have been helping couples choose the perfect diamond engagement ring for over 75 years. We have some tried and true methods of discovering her tastes and style to help you buy the setting that will keep her smiling for a lifetime.